When it&apos;s hot and dry, mosquitoes like nothing more than the refreshing taste of you. Biologists with the University of Cincinnati discovered that female mosquitoes bite not only to get the protein they need to lay eggs but also to quench their thirst during a drought. Now researchers are trying to find out just how often mosquitoes must bite to stay hydrated, which could help doctors fight illnesses such as malaria. The findings were published May 1 in Scientific Reports. "It makes sense," UC biology student and study co-author Elise Didion said. "We find the highest transmission rates of West Nile virus during droughts because mosquitoes may use blood meals to replace the water they lose." The researchers presented the study in January at the Society for Integrative and Comparative Biology conference. Mosquitoes often pose a nuisance and disease threat after rains when they can lay eggs in standing water. But UC&apos;s research found that dry conditions provide little protection from the biting pests. Because of the diseases they carry, mosquitoes are the deadliest animal threat by far to people. Malaria alone kills more than 400,000 people per year. About half of the world&apos;s population is at risk of infection. And mosquitoes carry a host of other fatal or debilitating diseases, including yellow fever, dengue and encephalitis. In the United States, mosquitoes have been known to spread viruses such as West Nile, Eastern equine encephalitis and Zika. Every new detail about their physiology and behavior could help health agencies fight mosquito-borne illness, UC biology professor Joshua Benoit said. "It will make for better modeling for when disease outbreaks occur," Benoit said. "When it&apos;s dry, it might be easier for a mosquito to locate a host than limited supplies of water or nectar." The new insights into mosquito behavior came about serendipitously, researchers said. UC students were studying a batch of thirsty, dehydrated mosquitoes when some escaped from a vial. "They noticed the mosquitoes were unusually aggressive," Didion said. "They were all trying to bite." Benoit and his students study mosquitoes in their biology lab, where adults of six species are sequestered in large mesh boxes in a room kept at a balmy 82 degrees. Each box has a source of water and nectar and a place to lay eggs to create a constant supply of lab specimens. "It&apos;s like the Ritz-Carlton in there," UC student Gabriela Nine joked. Researchers studied the common house mosquito, Culex pipiens, for the dehydration study. But the lab also is home to the more aggressive Aedes aegypti, the species most likely to spread diseases such as Zika, according to the Centers for Disease Control and Prevention. Female mosquitoes typically need the protein found in blood to lay eggs. Students warm a capful of chicken blood covered in a thin membrane that mimics animal skin. Mosquitoes are sensitive to carbon dioxide in animal breath, one of the fun ways they can follow you down a trail. Didion said she breathes into their mesh cage at feeding time to stimulate their appetites. Even so, just a few of the more than 1,000 mosquitoes in the cage responded by landing on the metal disk. Benoit said what&apos;s surprising about mosquitoes is how infrequently they will seek a blood meal when they have ample water and hydration. In their study, dehydration prompted as many as 30 percent of female mosquitoes to seek a blood meal. The researchers theorized that dehydration would lead to a suppressed metabolism, reduced activity and decreased blood feeding in the northern house mosquito. But surprisingly, they found that conditions of dehydration increased the propensity of mosquitoes to land and feed on a host. Meanwhile, mosquitoes with ready access to water did not seek blood meals at a higher rate when exposed to similar temperature and humidity. The students put their theories to the test in natural but controlled conditions at the UC Center for Field Studies, a sprawling research center outside Cincinnati. Researchers released adult mosquitoes in a large mesh enclosure called a mesocosm that mimics conditions they would find in nature. After more than a week, researchers introduced a membrane-covered disk of blood that mimics a bird or animal host. 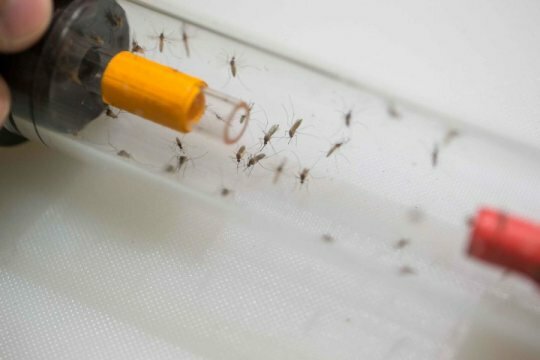 Researchers then collected blood-feeding mosquitoes on two occasions -- a day after it rained and a day after a dry spell -- to see what physiological differences they could detect in the two groups, along with random non-feeding mosquitoes they also sampled. The biologists found that dehydrated mosquitoes in the mesocosm were more likely to seek a blood meal compared to mosquitoes that were not thirsty. Benoit and his biology students collaborated with UC mathematical sciences professor Yanyu Xiao, who came up with models that predicted biting rates and the resulting disease transmission under varying weather conditions. "I had been working on mosquito-borne diseases such as malaria and West Nile, so it was the perfect match for me to expand my research network," Xiao said. Xiao said to track mosquito-borne illness, you have to understand human demographics, too. "In my literature review, I found that typical disease infection wasn&apos;t over the summertime but in transitory times when water levels shrink and the flowers dry up," she said. "Look at the daily pattern of rainfall and seasonal drought." Xiao says the study of those two patterns proves when mosquitoes are "really looking for human blood." Mosquitoes are a personal nemesis for her wherever she goes, whether it&apos;s Florida or Canada, Xiao said. "The mosquitoes in Alberta are giant. The first time I went to a conference there, I took a walk along the river after my presentation. After that I couldn&apos;t see, my face got bitten so badly," she said. Benoit said it does not take long for mosquitoes to become dehydrated to the point where they might seek a blood meal. "We saw the behavioral effects within two or three hours under low humidities and higher temperatures," Benoit said. "It was completely changing their behavior." Similar behavioral changes were observed in two other species of lab mosquito that were exposed to dehydrating conditions. UC student and study co-author Christopher Holmes said this research holds the promise of saving lives. "If we know how mosquitoes react to drought, we can better predict when you&apos;ll see a disease outbreak," Holmes said. "It&apos;s a step in the right direction toward understanding how the environment affects mosquitoes, which we really can&apos;t answer right now." A warming climate could mean more frequent and longer periods of drought in areas where mosquitoes pose a health threat.